Vitamin A is a fat soluble vitamin that is naturally present in quite a lot of the foods we eat. It also reduces inflammation, improves the youthfulness and health of our cells, thus making us look and feel younger. 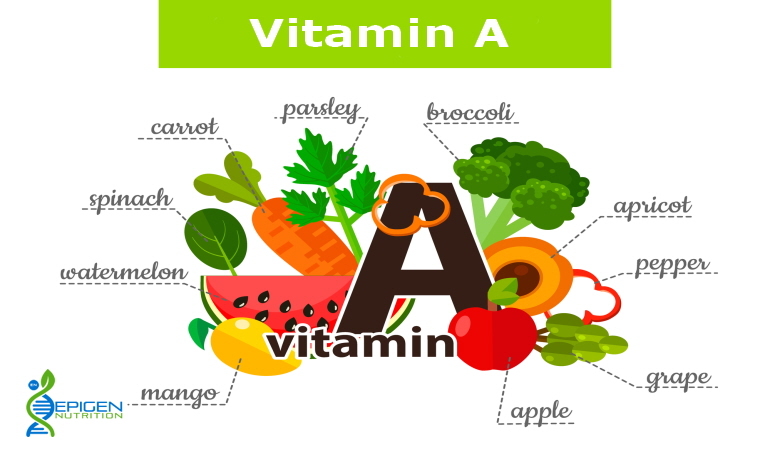 Vitamin A is a powerful antioxidant, and because of this it can help improve all over health, slows down, and sometimes even reverses, the effects of ageing. However, its specific benefits are also very important for people over the age of 50, when eyesight and the immune system begin to suffer. What Amounts of Vitamin A Should WeTake? Women should aim for 750mcg a day, and men for 900mcg a day. However, as this vitamin stores well, you can average this out. If you have a lot one day, have less the next, or if you haven’t had much for a week, have a couple of slightly high days. Note that lower values are recommended for infants and children younger than 14. How do I Know if I’m Getting the Right Amounts? Vitamin A deficiency can be quite obvious to even someone who is not a medical professional. Loss of eyesight, loss of bone density, repeat UTIs, etc., are common side effects of a severe vitamin A deficiency. Mild deficiency is less obvious. In situations where you are receiving the bare minimum, but not enough for the full health benefits, you will notice worse vision than usual, and a certain lifelessness and loss of colour in your skin and hair. On the other hand, a vitamin A overdose is a very serious, sometimes even life-threatening condition. It causes irritability, confusion, loss of appetite, vomiting, and hair loss. If you start feeling these symptoms, see your doctor immediately. How Do I Get My Vitamin A? There are two main types of vitamin A: retinol and beta carotene. Retinol is vitamin A from animal sources, and is identical to the vitamin A in our bodies, so we don’t need to process or convert it. Beta carotene is a vitamin A precursor, that is to say, it’s something which turns into vitamin A inside our bodies. Some of the top food sources of retinol include beef liver, fish and dairy. When Should I Consider Supplements? Because vitamin A is a fat soluble vitamin, if you have any trouble absorbing fats you may need to consider a supplement. This is because vitamin A needs to be dissolved in fats so as to be carried around our bodies. In rare cases where fat absorption is impossible due to a weak gut or pancreas, a routine injection or drops may be considered. Vitamin A overdoses are very easy to trigger and can have very serious health consequences. In a “living in the wild” situation, humans would never risk vitamin A overdose. In fact, in most poor societies it is unheard of, with deficiency being the biggest risk. This is because there are only two ways to overdose on vitamin A. The first is by supplementation. Eating large amounts of retinol supplements will cause you to overdose. And the second is by living largely off organ meats. In a natural environment, we would eat much more muscle than organ meat, and much, much more beta carotene than retinol. Beta carotene is almost impossible to overdose on, as it needs to be converted to vitamin A and our bodies will stop when they have enough. But in the modern world we can easily eat plate after plate of pâté and end up with a vitamin A overdose. So, if you show any signs at all, discontinue vitamin supplementation, avoid eating offal, and consult with your doctor. Chemical Names: Retinol, Retinyl Palmitate, Betacarotene. Beneficial for: Protects eye health. Is an excellent antioxidant and immune system booster. Protects against infections. Could lower the risk of certain cancers such as lung or prostate. Great for promoting healthy skin. Signs of Being Deficient (hypovitaminosis A): Poor night vision. Frequent colds or infection. Mouth ulcers. Acne. Dry flaky skin. Dandruff. Cystitis or thrush. Diarrhoea. Good Food Sources: Beef liver, veal liver, carrots, sweet potatoes, kale, spinach, apricots, romaine lettuce, broccoli, eggs, red peppers, tuna, mango, tomatoes. Absorption Assisters: Vitamin C and vitamin E help to protect it. Zinc. Best taken with a multi or antioxidant formula and with food. Absorption Inhibitors: Alcohol, coffee, heat and smoking. NB: Absorption assisters and inhibitors are factors that will either help or hinder the absorption of the specific nutrient into the body, for its best effect. There are 2 types of oil you can get from carrots: 1. Carrot seed oil This is the oil extracted from the seeds of carrots. The orange carrot we see grows inside the earth and oil can be extracted from the seeds that grow above the ground. 2. Carrot Oil This is the one explained in the link above. It is called essential oil because like you rightly asked, the orange carrot we eat does not contain oil but it contains essential nutrients like beta carotene. To extract this beta carotene, we need another oil known as carrier oils to extract this important nutrient. Examples of carrier oils you can use for this are virgin olive oil, virgin coconut oil and many more. Hi Fabian, I was tempted to include a bit about carrot oil. But although it has shown antioxidant activity, there is still ongoing research being done before the full benefits can be written up.